Listen, we don't know if ghosts exist. But if they do we know they want us talking about them on a Segway tour. 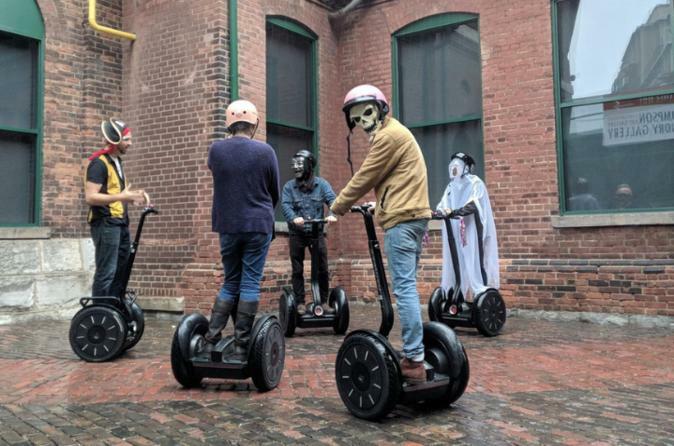 Our guided Segway Ghost Tour features a bunch of stories we definitely didn't make up about the spirited side of the Distillery District. This tour is sometimes in dark conditions, please dress for the weather. If you survive, we even have a bone-shaking treat for you at the end! The tour meeting point is in the Distillery District at our tour office. Start off with instruction and one-on-one training on how to use the Segway PT. The tour is usually conducted in the evening and is a great way to learn about the darker side of the site mixed with some history along the way. The Gooderham and Worts Distillery started in 1832 and many of the original buildings from the late 1800s are still standing. Many of the buildings have had strange occurrences over the years, with some employees vowing never to work alone or into the night. Stops include sites within the Distillery District where ghosts have appeared or mysterious events have occurred. The tour is entirely outdoors (dress for the weather) and suitable for ages 12 years and up. The experience includes training, plus about 40min of touring.